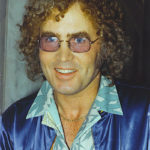 Jan Berry, circa early 1970s — (courtesy Berry Family). Jan with Suzanne Graeber in 1970, following the pioneering surgery on his right leg — (courtesy Berry Family). Jan with his sister-in-law Joanie Berry. 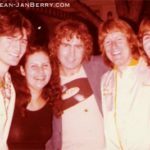 Joanie, who died of cancer in 2018, was Jan’s brother Ken Berry’s wife — (courtesy Berry Family). Jan in the studio, early 1970s — (courtesy Berry Family). Jan onstage, 1979 — (courtesy Berry Family). Jan with his German shepherd puppies, mid-1970s. Jan circa 1979 — (courtesy Berry Family). 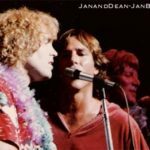 Jan & Dean in concert, with actor Richard Hatch (center), ca. 1979 — (courtesy James Armstrong). 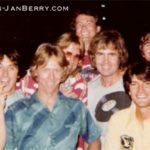 Jan & Dean with Papa Doo Run Run and actor Bruce Davison. FROM LEFT: Don Zirilli, Jimi-Jo Rush, Bruce Davison, Dean Torrence, Krazy Jim Shippey, Jan Berry, Mark Ward, and James “Jimmy D.” Armstrong, ca. 1979 — (courtesy James Armstrong). 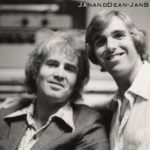 Jan with James “Jimmy D.” Armstrong, ca. 1979 — (courtesy James Armstrong). FROM LEFT: Mark Ward, Jan Berry, Dean Torrence, and James “Jimmy D.” Armstrong, ca. 1979 — (courtesy James Armstrong).